The story of Aabhaasam is about an overnight bus journey from Bangalore to Kerala where the travelers analyze the schizophrenic society and how it has evolved through different times. 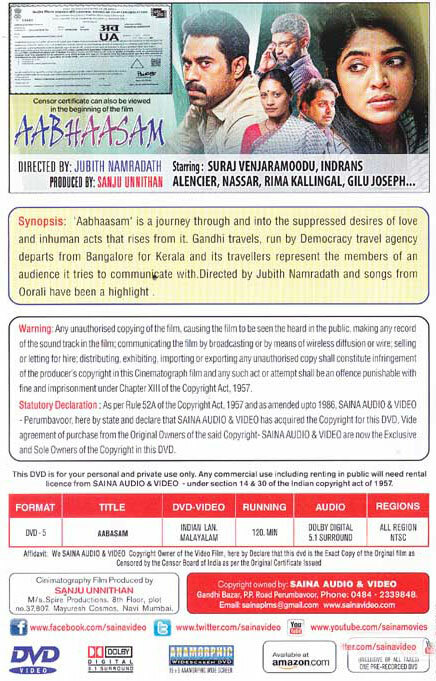 'Aabhaasam' is a journey through and into the suppressed desires of love and inhuman acts that rises from it. Gandhi travels, run by Democracy travel agency departs from Bangalore for Kerala and its travellers represent the members of an audience it tries to communicate with. The journey happens over a night where it becomes a partial analysis of a schizophrenic society which evolved through different times, with its eyesight diminished to binary views under a systemic frustration of patriarchy. Here bus becomes the frame of a system and its perpetrators and victims, the travellers. In its ambition, the film is two fold. One as the subject and one as its critique. The confined space of this bus, welcomes and critiques the mainstream audience who would watch and celebrate the events in it.